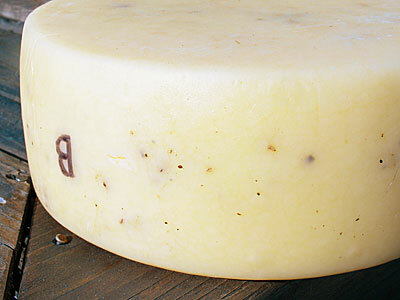 Pepato Toscano is a tuscan style cheese cheese with a kick. The basis of this cheese is a Vacha Toscano, a cow milk cheese made in the south of Tuscany. 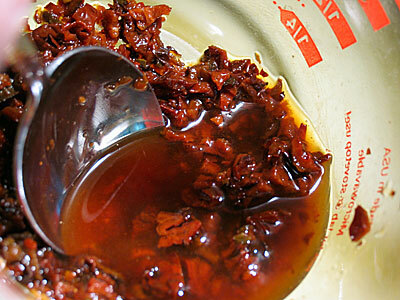 Although this recipe has a sweet and spicy. The goal for this cheese is not to create a fiery cheese, but to blend the spicy flavor of the peppers with the mellow character of the curd. Heat milk to 98F, then add cultures and let ripen for 60-90 minutes. Until TA% .20. While the milk is ripening, prepare the peppers, a light touch is best. I like to use four, home smoked jalapeños. 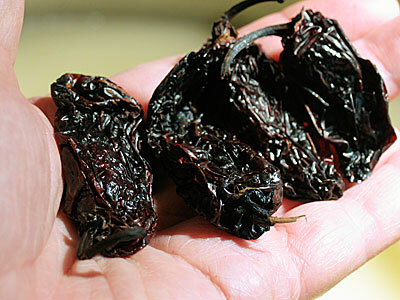 These are smoked slowly enough to caramelize the sugars, for spicy, smokey & sweet flavors. Remove seeds from the jalapenos, then chop and rehydrate them. 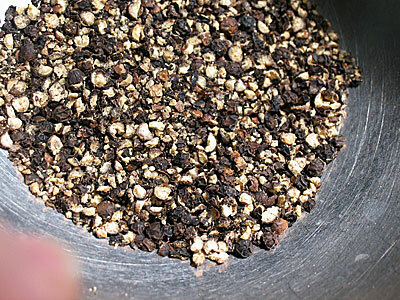 The peppercorns should be roughly broken, so that you get the bright pepper flavor blended with the cheese. 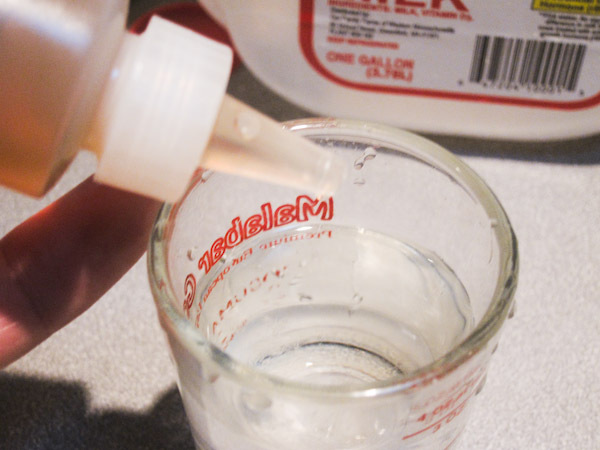 These two can be mixed and set aside for step 6. 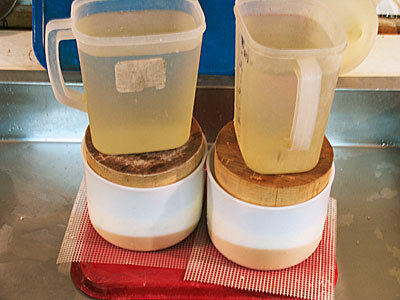 Following ripening and after the rennet has been added, the milk remains still until you have a firm curd set, about 20 minutes. 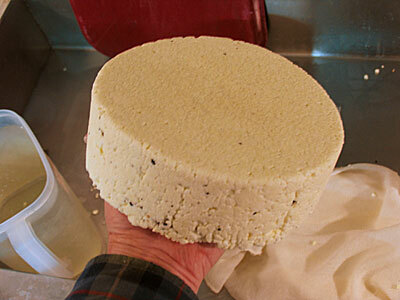 Once set, cut the curd into 3/4" squares and then let rest for 3-5 minutes. Cut the curd into smaller pieces, with a large whisk, then stir the curd for 10 minutes. 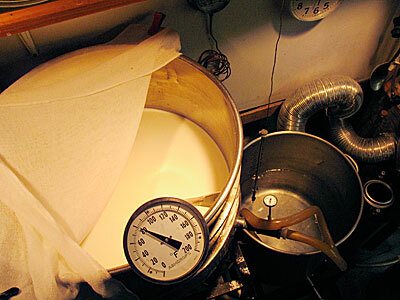 While continuing to stir, heat the curd to 118F over a 30 minute span of time. 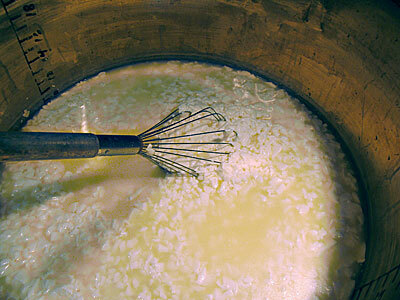 The curds will want to mat together, to prevent this, continue stirring. Once heated, continue stirring for another 20 minutes. 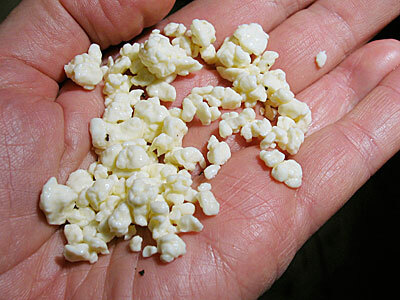 As you continue to stir the curds more acid will develop, and the curds will continue to lose whey. 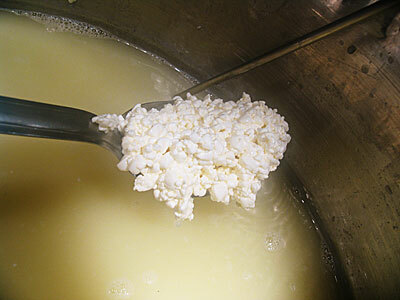 After stirring let the curds settle to the bottom of the pot until they reach TA% .16-.18. 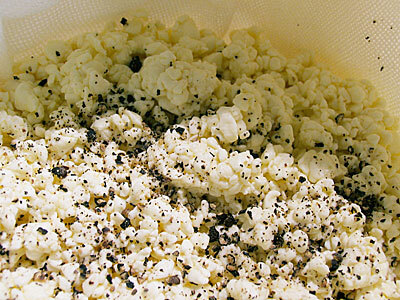 Note: By controlling moisture in the final curd you can control the texture of the final cheese. Softer curds, stirred for a shorter time, will make an early ripening cheese with more moisture that can be enjoyed as early as 2-3 weeks. 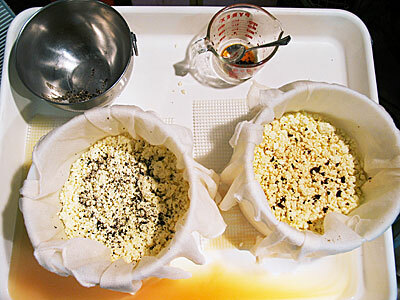 Harder curds, stirred longer, will make a longer aging cheese that will be ready in 9-12+ months. Drain the whey down to the curd level. 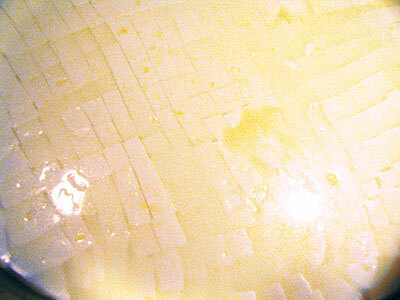 Transfer the final curd into cheese molds alternating with layers of peppers. Keep the pepper away from the top, sides and bottom for a tight smooth rind. Add pepper in 3-5 layers during molding. 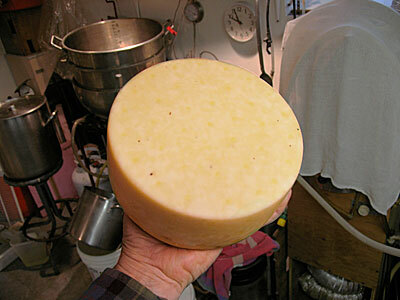 Once pressed, let the cheese can rest overnight, with no weight. The next morning, the draining whey should be TA% .64-.68 curd pH5.2. 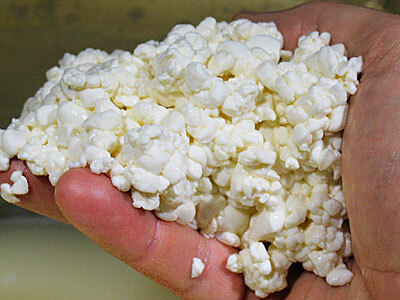 Note: The curds will need to stay warm while pressing and resting, 90-100F. 1 wk. 90-95% RH 52-58F to develop rind then 85% RH wipe with a light brine to keep mold down. 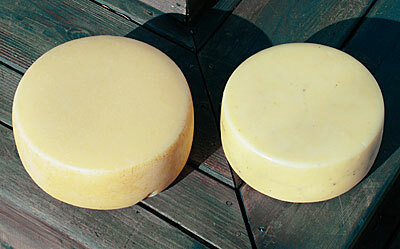 The final aging time will depend on the amount of moisture in the cheese. 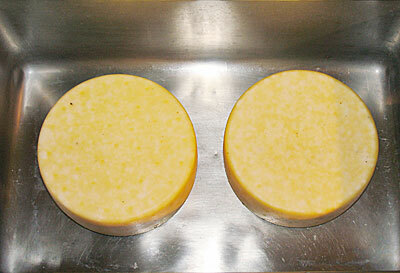 2-3 weeks for a moist cheese and 9 months to a year or more for drier more complex cheese.